While I don’t talk about it a great deal, I love history. I actually went to school to be a high school history teacher, since I couldn’t think of anything better than teaching one of my favorite subjects and making it fascinating for teenagers. Even though my life obviously went in another direction, I still love to catch up on current events and some of the latest findings. Of course, some of the most intersting non-fiction, at least in my opinion, are some of the books predicting what may very well happened based on technology, current events, and historical trends. 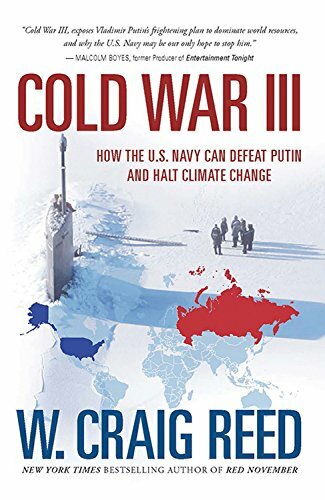 Recently, I had the chance to read a new book predicting a potential third cold war – Cold War III: How the U.S. Navy Can Defeat Putin and Halt Climate Change by W. Craig Reed. Looking for a fascinating book mixing both politics, prediction, and current economic situations? If so, we think you will love Cold War III: How the U.S. Navy Can Defeat Putin and Halt Climate Change. This book discusses how Russia and the United States could very well be on the verge of a third cold war due to resources in the arctic ocean, as well as economic chaos and global conflict. Along with making his point about Vladimir Putin being a danger to the free world with his invasion of the Ukraine (which he sees as only the start), he discusses how the Navy has top secret technology that could very well defeat Putin, create jobs, and mitigate climate change. The problem he sees in this, however, is that there is very little time for political leaders to act throughout the world. Honestly, this book seemed a bit farfetched to me, but the author did make some very interesting points. At a few points, I almost think the writer tried too hard to make connections to pop culture scenarios like Lord of the Rings and Harry Potter, which was a bit of a turnoff to me personally. He does do a great job backing up his points with facts, and I will say that this was a very fascinating read, at least in my opinion. I was curious enough to see his supporting points and argument for the future that I wasn’t upset at all to be finishing this book, making it an okay book for a quick weekend read, especially if you enjoy speculative non-fiction that mixes economics and politics. Based on our own experience, I am happy to give Cold War III: How the U.S. Navy Can Defeat Putin and Halt Climate Change a B rating. Want to purchase this book for yourself? You can buy Cold War III: How the U.S. Navy Can Defeat Putin and Halt Climate Change on Amazon.com for only $10.05 or buy it for your Kindle for only $3.99. Disclosure: Budget Earth did not receive monetary compensation for this review, but did receive products for review purposes. All opinions on this product are my own honest assessment, and may differ from our readers’ opinions.